LANSING — Aaron Aikman brings cult classic vehicles to life. Two years ago he teamed up with How-To Halloween founder Jerry Jodloski to recreate the Ghostbusters’ Ecto-1, and last year the pair turned a rusted out 1970 Dodge A100 van into the Mystery Machine, Scooby Doo’s classic ride. But his latest project, KITT from the classic 1980s television show “Knight Rider,” is Aikman’s dream car. The Lansing State Journal reports that Aikman and his wife Christina parked the car May 22 at Olympic Broil for an unveiling, alongside the Mystery Machine and Ecto-1. 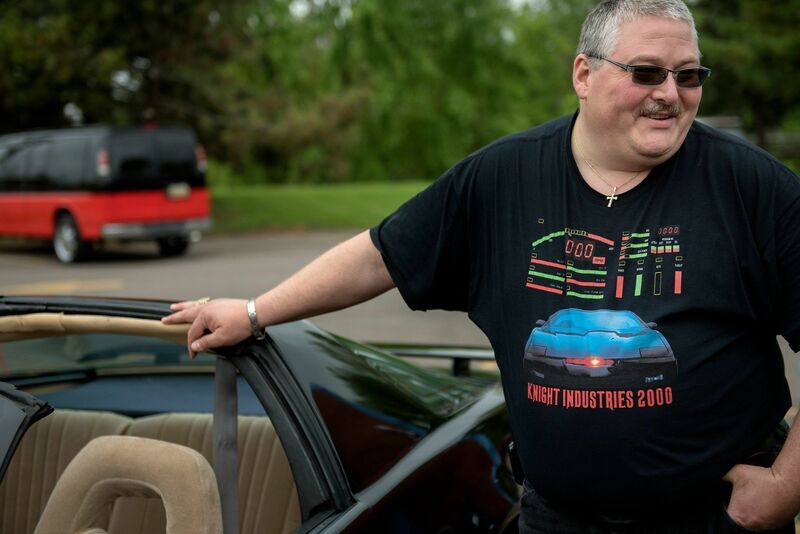 He bought the 1988 Pontiac Trans Am a year ago for $1,700 and spent a year converting it, devoting weekends and nights when he wasn’t driving a bus for Capital Area Transportation Authority to the build at his Lansing home. “These seats are hard to find,” Aikman said. He lucked out, connecting with a car enthusiast through a Knight Rider social media group who sold them to him for a fraction of their cost. Aikman’s KITT comes complete with the curved, lit dash board and automated twin screens. It plays the television show theme song and sports the voice of the artificially-intelligent car that on screen was virtually indestructible, and indispensable, to Hasselhoff’s character Michael Knight. Aikman added the steering wheel. His cousin Jim Snellenberger built the center console and Jodloski helped with the console’s video screens. “The details make a big difference,” Snellenberger said. “I try my best,” Aikman said. It’s as close to the television version of KITT as he could make it, he added.